The whispers haunt her dreams and fill her waking hours with dread. Something odd is happening. Something…unnatural. Possession of the living. Resurrection of the dead. And Natalie Stewart is caught right in the middle. Jonathon, the one person she thought she could trust, has become a double agent for the dark side. But he plays the part so well, Natalie has to wonder just how much he’s really acting. Miss Hieber has done it again. I thought that Darker Still was gorgeous, witty, and deliciously gothic, but The Twisted Tragedy of Miss Natalie Stewart takes this series to a whole new level. The plot was wonderful with Leanna’s typically meticulous pacing–never boring but meant to be savored not devoured. It picks up almost right where Darker Still leaves off and leads the story down a deeper, darker path which achieves still greater heights of epic awesome. The use of imagery and absolutely gorgeous prose continues to make this series stand out among its peers. Start to finish, the novel’s world is utterly captivating. Though the format is very different from the first book, it does not feel strange of disjointed. Rather, the story flows seamlessly. Character-wise, much changes. This installment of the Magic Most Foul series sheds new light on several minor characters as well as further development of the central players. Jonathan, Lord Denbury, while one of the central characters of Darker Still, takes on a more secondary role in Twisted Tragedy. While I missed some of the connectedness between him and Natalie, it was beautiful to see her shine, especially when she was left to her own devices. She was able to grow into a stronger, more independent character which was both necessary to the plot and her growth as a person. 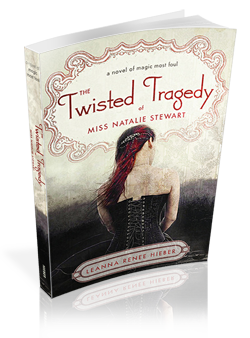 Overall, The Twisted Tragedy of Miss Natalie Stewart was an absolutely captivating read full of twists and turns and gothic beauty that will leave you begging for more. This series sounds great. I haven’t read the first book yet, but definitely will keep them in mind! Danny, they are really fun reads! =) I hope you love them! Ooh, sounds fantastic. And that cover is absolutely stunning!